Pictures of iconic Mesa Arch, often photographed in the early morning glow, frequently grace the pages of calendars and coffee table books. 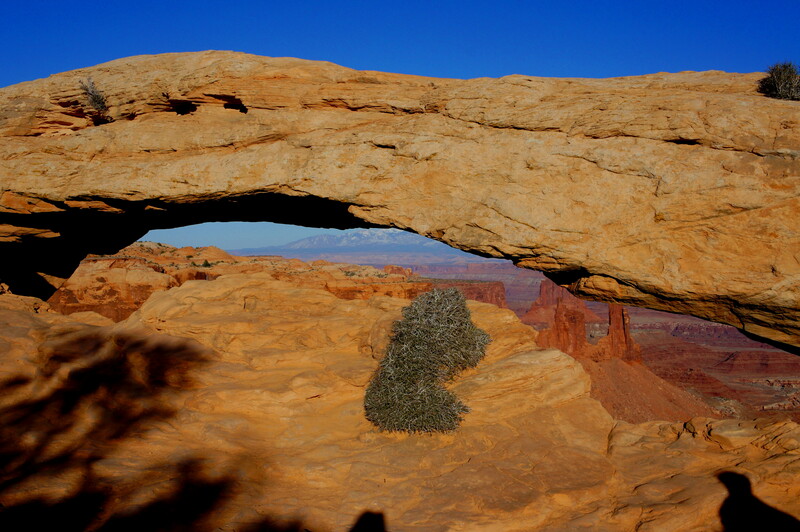 There is something about the arch, maybe the most popular destination in Utah’s Canyonlands National Park, which catches the eye. Perhaps it is the setting—the rare instance in which a natural arch is situated at the brink of a cliffside. 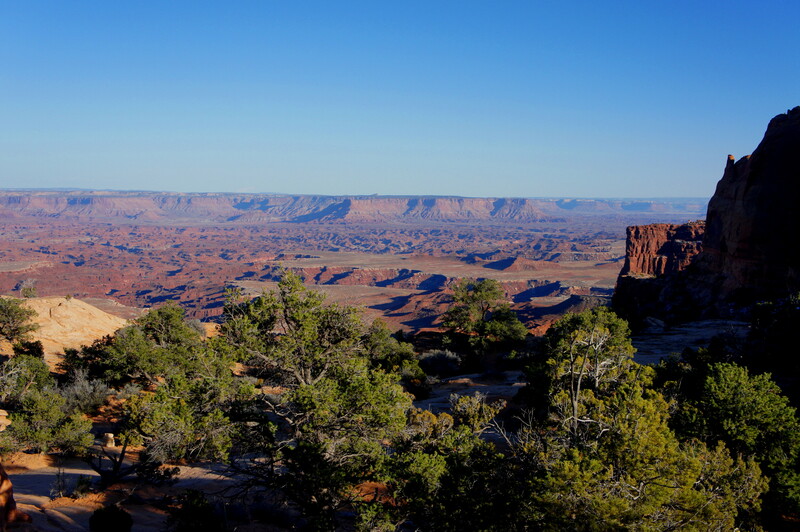 To others, it is the frame: the thin span captures a beautiful landscape to the east, including the La Sal Mountains and a seemingly endless string of Wingate sandstone cliffs. Finally, Mesa Arch is attractive to the adventurous type—as one can (carefully) walk across the top with relative ease. A short, ½-mile loop leads to and from the arch. Don’t expect solitude at Mesa Arch, as even the wee hours before sunrise bring a gaggle of photographers preparing for the iconic early morning shot. 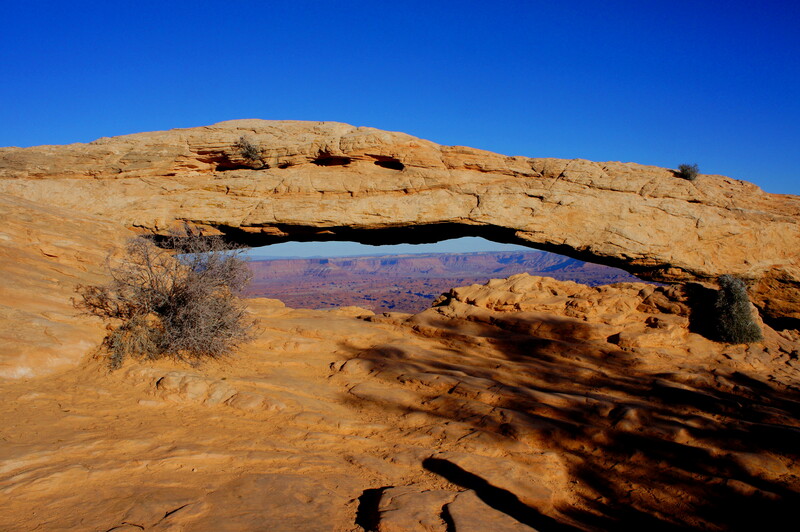 The hike’s popularity also stems from its ease of access: the Mesa Arch Trailhead is located just 10 minutes south of Canyonlands’ Island in the Sky Visitor Center. While chock full of shallow wooden stairs, the Mesa Arch Trail is not particularly demanding—and visitors should not get hung up on whether to complete the loop in a clockwise or counterclockwise direction, as both feel similar. The trail must first clear a couple of low sandstone ridges, but it is within reason to reach the arch in less than 10 minutes. Mesa Arch on its own is not the most impressive of natural apertures. In some ways, it’s little more than a thin crack in the cream-colored Navajo sandstone. But what makes it spectacular is the fact it is perched on the edge of a picturesque vista—a view that is particularly scintillating the early morning or late afternoon. The most striking spectacle is a pair of spires to the east—Monster Tower and Washer Woman Arch—which rises more than 1,000 feet above the White Rim plateau. Behind these pillars is the Airport Tower, a solitary butte separated from the main hunk of Wingate sandstone over time. To the southeast are the three forks of Buck Canyon and, beyond that, the Colorado River. Another line of red-orange Wingate cliffs fills the horizon, accompanied to the northeast by the La Sals. Exercise caution—and patience—at this popular destination on the precipice of the cliff. 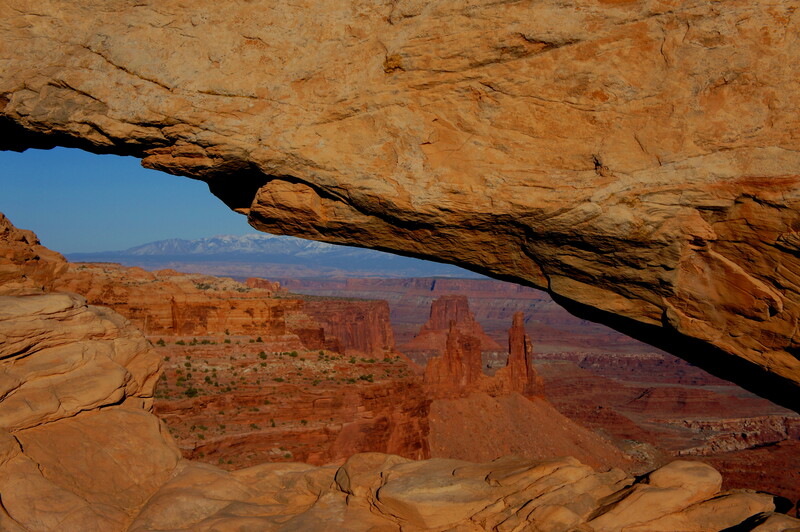 A nice spot to take in the views, away from the crowds, is atop a high sandstone knob to the south of Mesa Arch. Stop here for a break—then return to the trail and complete the loop back to the trailhead. 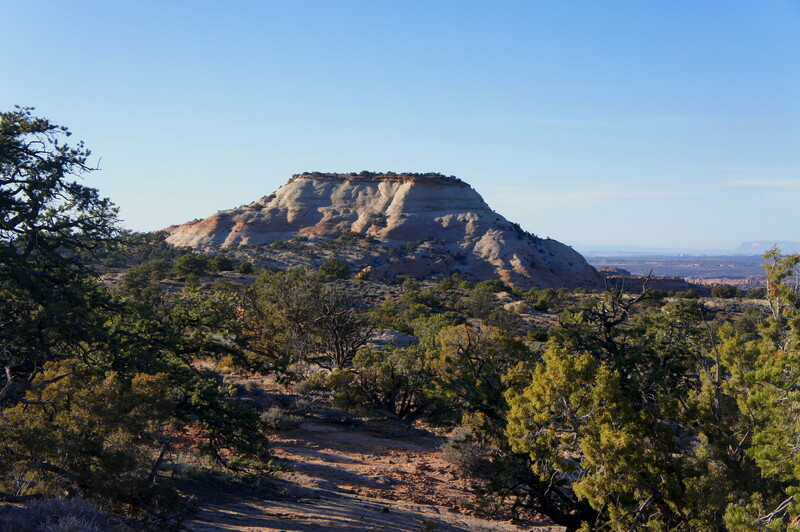 The colorful outcrop across the street to the northwest is Aztec Butte, another prime example of Navajo sandstone. It also possible to make out a glimpse of Trail Canyon just beyond Aztec to the north. This entry was posted in Canyonlands National Park, Easy Hikes, Utah and tagged Airport Tower, arch, Aztec Butte, Buck Canyon, Canyonlands, Island in the Sky, loop hike, Mesa Arch, Monster Tower, Navajo sandstone, Utah, Washer Woman Arch. Bookmark the permalink.